This Pressure Cooker Whole Chicken is juicy, tender, flavorful and very easy to make. This delicious rotisserie style Instant Pot Whole Chicken cooks in less than 30 minutes making it the perfect instant pot recipe for a weeknight meal. This Pressure Cooker Whole Chicken has been the solution to many of my meals. 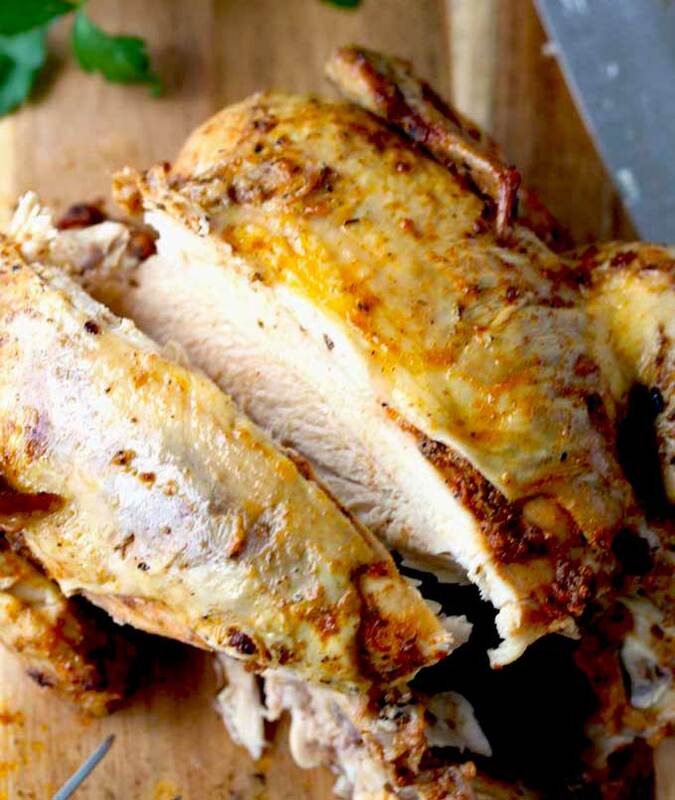 Although I love roasting whole chickens in the oven, this quick and easy Instant Pot Whole Chicken is my go-to-recipe when I want to have delicious rotisserie style chicken at home. This easy and tasty pressure cooker whole chicken can be made with fresh, thawed out or frozen chicken. I like serving it with Crispy Roasted Greek Potatoes, and fresh and Creamy Cilantro Cole Slaw. Use the leftover chicken to top salads, or on casseroles, quesadillas and soups like this Chicken Tortilla Soup. 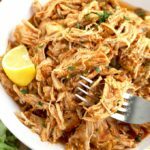 One tasty Instant Pot Whole Chicken – many meal possibilities! Combine the spice rub ingredients. Rub the chicken with oil and season well. I like to get some of the spice rub under the skin for maximum flavor! Press the “saute” option. Add the olive oil into the instant pot and when hot, brown the chicken breast side down. Using kitchen tongs flip the chicken and sear the other side. Remove the chicken from the pressure cooker and set aside. Deglaze the pot by pouring chicken broth into the pot and scraping the bottom with a wooden spoon. Press “cancel/warm” and carefully place the trivet at the bottom of the pot. Place the chicken on top of the trivet, breast side up. Cook on high pressure and set the timer. When done, let the pressure release naturally for 15 minutes, then do a quick release to get rid of any remaining pressure. Open the lid and remove the chicken. For extra crispy skin, you can broil the chicken for 4 to 5 minutes. Can I Cook A Frozen Whole Chicken In the Pressure Cooker? Yes, you can cook a whole frozen chicken in your pressure cooker however, do not sear the chicken while frozen. Season the chicken and cook it on high pressure (see recommended times below). After the chicken is completely cooked, brush it with olive oil or melted butter and place it under the broiler for a few minutes to crisp up the skin. The chicken should be at about 6 inches from the heat source. 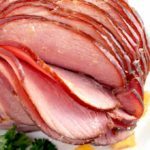 One of the best things about cooking in an Instant Pot is that you can cook meat from fresh or frozen. 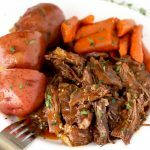 If like me, you tend to forget to thaw out meat for dinner, the instant pot is going to be the solution to many of your meals! This pressure cooker whole chicken recipe is so versatile! The simple homemade spice rub can be adjusted to your taste. 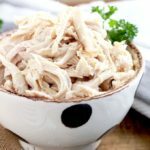 Making Instant Pot Whole Chicken requires minimal effort and always turns out juicy, tender and full of flavor! 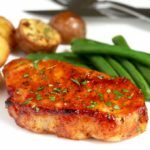 Chicken is a budget friendly meal and when cooking a whole chicken, there are usually leftovers to prepare a second meal. 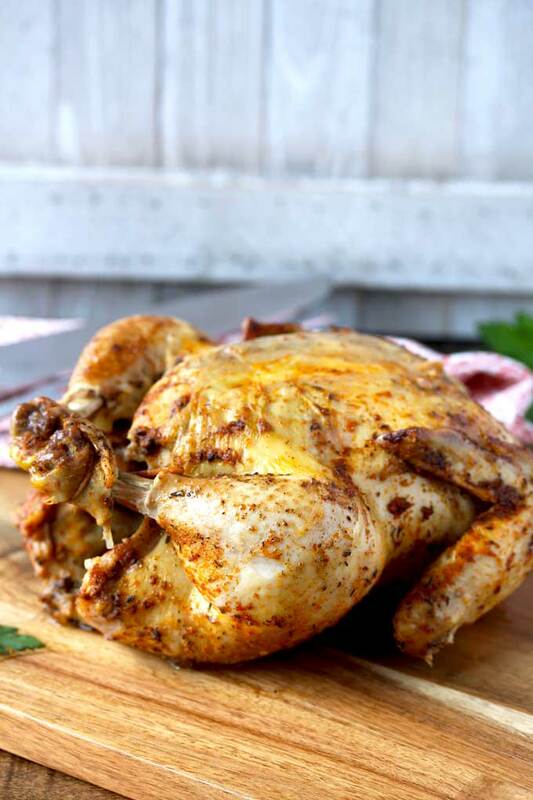 Homemade Rotisserie chicken is so much healthier and flavorful than store bought. You can control the quality of the ingredients and the amount of sodium and fats! How Long To Cook a Whole Chicken in the Instant Pot? TIP: Calculate cooking times by multiplying the number of pounds of fresh chicken by 6 minutes. IMPORTANT NOTE: As with all pressure cookers, cooking times can vary slightly. Make sure the chicken reaches an internal temperature of 165 degrees Fahrenheit before consuming. A 3 – pound chicken will need 18 minutes of High Pressure Cooking Time with a 15 minutes Natural Pressure Release. A 3.5 – pound chicken will need 22 minutes of High Pressure Cooking Time with a 15 minutes Natural Pressure Release. 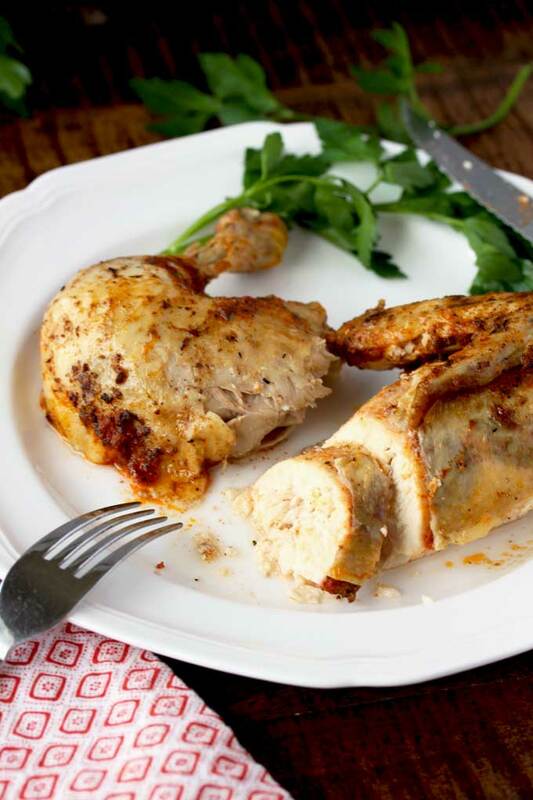 A 4 – pound chicken will need 24 minutes of High Pressure Cooking Time with a 15 minutes Natural Pressure Release. A 4.5 pound chicken will need 27 minutes of High Pressure Cooking Time with a 15 minutes Natural Pressure Release. A 5 pound chicken will need 32 minutes of High Pressure Cooking Time with a 15 minutes Natural Pressure Release. A 3 – pound chicken will need 39 minutes of High Pressure Cooking Time with a 15 minutes Natural Pressure Release. 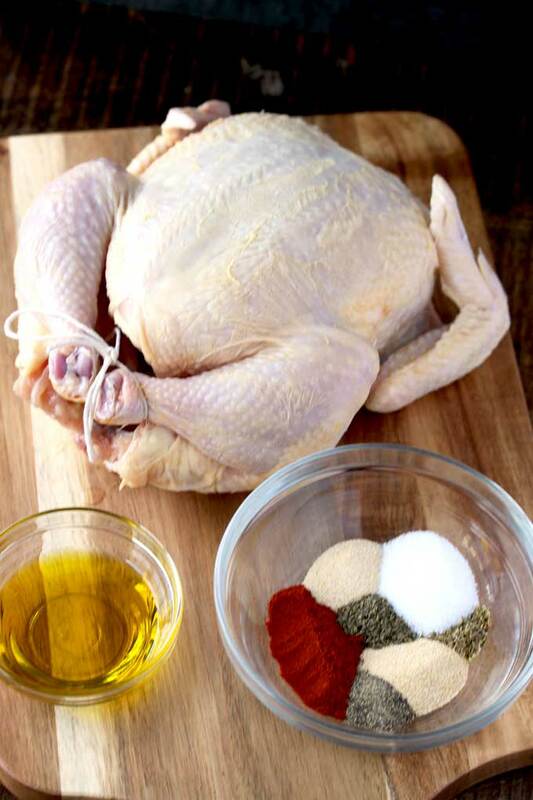 A 3.5 – pound chicken will need 46 minutes of High Pressure Cooking Time with a 15 minutes Natural Pressure Release. 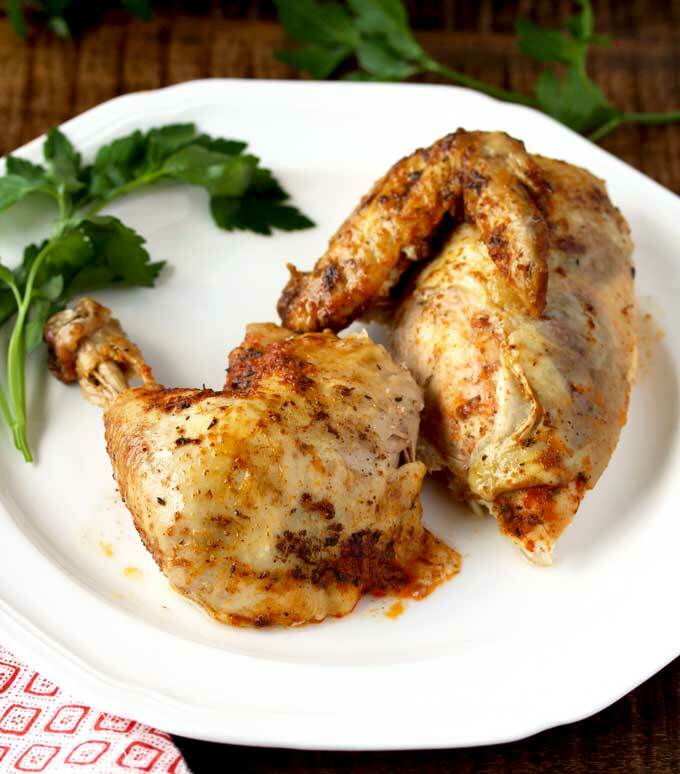 A 4 – pound chicken will need 52 minutes of High Pressure Cooking Time with a 15 minutes Natural Pressure Release. A 4.5 pound chicken will need 59 minutes of High Pressure Cooking Time with a 15 minutes Natural Pressure Release. A 5 pound chicken will need 65 minutes of High Pressure Cooking Time with a 15 minutes Natural Pressure Release. This pressure cooker chicken recipe uses a simple “rotisserie style” seasoning mix. Paprika, garlic powder, onion powder, thyme and oregano. Of course, you can use any seasonings you like. Lemon Pepper, Italian seasoning and smoked paprika are all good options. Keep in mind that when cooking pressure cooker recipes it always takes some time for the pot to come to pressure. When the cooking time is up, your instant pot will beep. 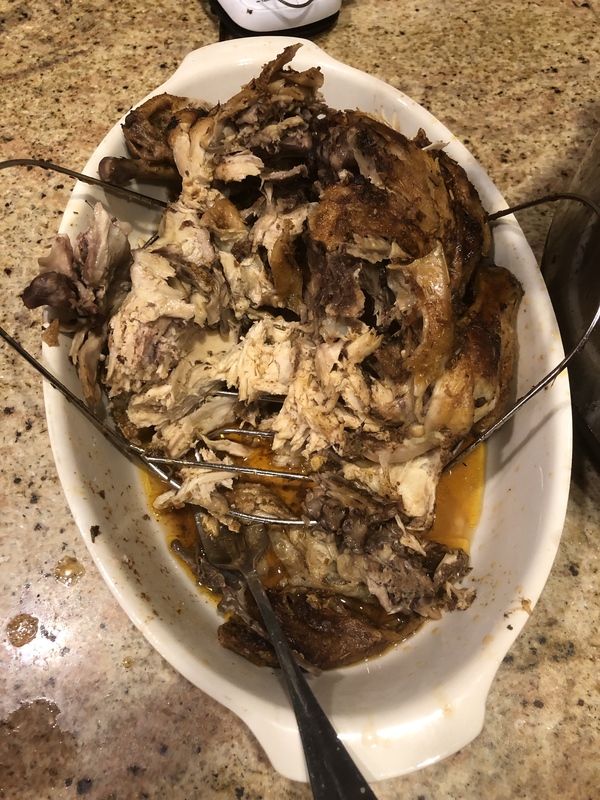 You can do a complete natural release, instead of the 15 minutes I suggest in the recipe – however, every time I have done that, the chicken falls off the bone so easily that I always have to be extra careful removing it from the instapot. I like buying smaller chickens. I always try to get chickens that are about 4 pounds. I rub the chicken with a little bit of olive oil and then the spice mix (I loosen the skin a bit and try to get as much seasoning under the skin as possible. I think the seasoning sticks better to the meat and imparts the most flavor. 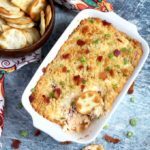 What To Serve with this Instant Pot Whole Chicken? WANT TO TRY THIS PRESSURE COOKER WHOLE CHICKEN? 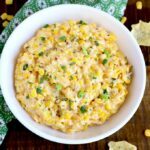 PIN IT TO YOUR DINNER OR INSTANT POT BOARD TO MAKE IT LATER!! 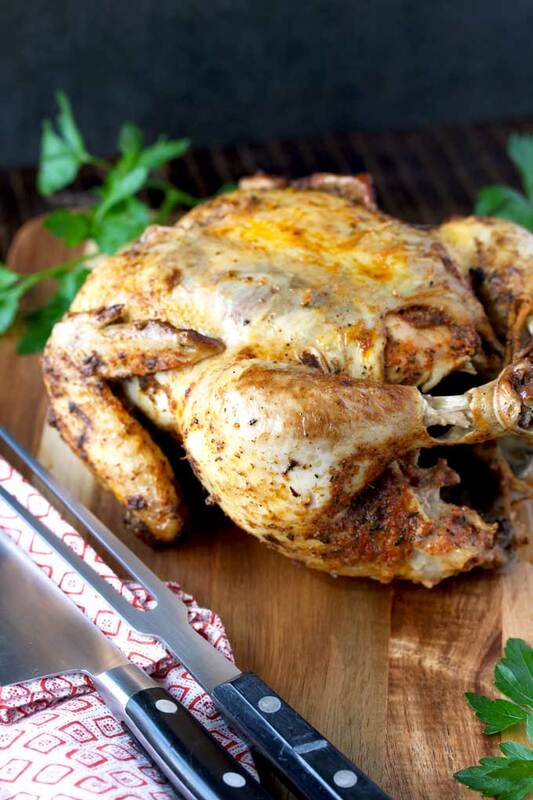 This Pressure Cooker Whole Chicken is easy, juicy, tender and cooks in less than 30 minutes! 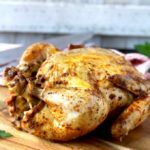 This rotisserie style instant pot whole chicken is delicious and a great and simple weeknight meal. Press the Saute function and add the remaining olive oil to the pot. Press Cancel/Warm and place the trivet at the bottom of the pot then lay the chicken on top of trivet, breast side up. Close the lid and set the valve to "seal". Press the MANUAL or HIGH PRESSURE button and set the timer to 24 minutes (this is for a 4-pounds chicken). 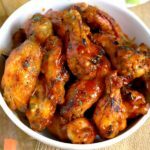 **Check the recipe notes for smaller/bigger chickens. As with all pressure cookers, cooking times can vary slightly. Make sure the chicken reaches an internal temperature of 165 degrees Fahrenheit before consuming. A 3 - pound chicken will need 18 minutes of High Pressure Cooking Time with a 15 minutes Natural Pressure Release. A 3.5 - pound chicken will need 22 minutes of High Pressure Cooking Time with a 15 minutes Natural Pressure Release. A 4 - pound chicken will need 24 minutes of High Pressure Cooking Time with a 15 minutes Natural Pressure Release. Nutritional information provided is an estimate and will vary based on weight and brands of ingredients used. Decided to try out this recipe for my first time instant pot use and it turned out incredible. I had bought some powdered gravy, and added the remaining stock and drippings to it. I can’t wait to make it again! Our chicken was about 3 pounds and I set it for 16 minutes! Thanks for the recipe. Thanks for the feedback. Glad you enjoyed it! For some reason, 6 pound chickens have been on sale for the past few months here so I have done about 8 chickens. A couple of things seem to affect cooking time: 1) Temperature of ingredients and the chicken after browning (when starting the cooking time). 2) Temperature of the POT at start of cooking time. 3) How the pot calculates cooking time (begins when “start” is initiated, begins when pressure is reached, does or does not include pressure relief time). I have an InstantPot model IP duo080. It does not start cooking time until pressure is reached and the end of the set cooking time triggers the beginning of the pressure relief. The pressure build up will take longer if I brown the chicken on the stovetop (because the pot is cool when it starts). It will also take even longer if I then add broth, veggies or stuffing right out of the refrigerator. On the other hand, if I make stuffing just before using it so it is basically room temp, brown the chicken well in the pot (chicken is warmer), add broth to deglaze it and bring the broth to a boil before adding the trivet and chicken, add veggies under the chicken that are at room temp (pot & ingredients are warmer), the cooking time for a 6 pound chicken is absolutely perfect (stuffed or unstuffed) at only 20 minutes. Total time including pressure rise and pressure release is about an hour with natural pressure relief. We do not live at altitude, only about 800 feet above sea level. This model also goes into “keep warm” when pressure has dispersed. If I am gone or not ready to eat, even an hour won’t over cook the chicken. I used a thermometer to verify proper temps for chicken and stuffing. 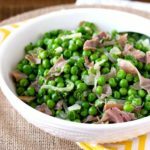 If for some reason it needs to be cooked more, you can always pop the top back on and cook a few minutes but if it is overcooked you can not “uncook” it! I use this thought process of considering the temp of the pot and ingredients whatever I am cooking and it has served me well. Thanks for the great recipies and all the effort you and your followers put into informing us to make us better cooks. I hope this post might return the favor for someone. I will definately be trying the beer substitute for broth in this recipe! Thank you for sharing with us all these great information! Glad you are enjoying the recipes and process! Just wondering if you still add the liquid to the pot if doing a frozen chicken?